Belize NMS: Moist and slightly unstable conditions exist over the area. 24-hour forecast: Cloudy at times along with a few showers and thunderstorms mostly over inland areas today, but also over northern and central parts of the country; decreasing and then affecting mainly over the south tonight. General Outlook: For Monday and Monday night is for a few showers or isolated thunderstorms mainly inland during the day and over the south during the night. Otherwise, showers or thunderstorms will be isolated. Today E 10-20 kts Moderate-Rough 4-7 ft A FEW SHOWERS AND ISOLATED THUNDERSTORMS. Tonight E 10-20 kts Moderate-Rough 4-7 ft A FEW SHOWERS AND ISOLATED THUNDERSTORMS MAINLY OVER THE SOUTH. Tomorrow E-NE 10-20 kts Choppy-Moderate 3-5 ft A FEW SHOWERS OR ISOLATED THUNDERSTORMS. Outlook E-NE 10-20 kts Choppy-Moderate 3-5 ft A FEW SHOWERS OR ISOLATED THUNDERSTORMS MAINLY OVER THE SOUTH. Mostly low level dry air is across the basin as shown by GOES-16 water vapor imagery. GOES-16 RGBs also indicate that a thin layer of Saharan dust moves across the basin. This along with strong deep layer wind shear keep the Caribbean mostly convection free. 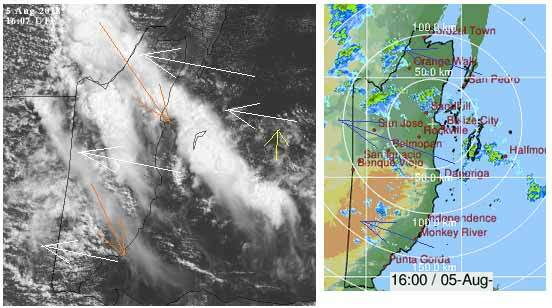 Shallow moisture associated with the passage of a tropical wave that currently moves across the Yucatan Peninsula support scattered to isolated showers within 90 nm off the coast of Cuba and within 150 nm of the coast of Honduras and Nicaragua. A second tropical waves moves over the E Caribbean waters supporting scattered showers and tstms from 13N-17N E of 71W. Otherwise, strong high pressure N of the area supports fresh to near gale force winds along the coast of Colombia and Gulf of Venezuela. No major changes expected through Monday. See the tropical waves section for further details on the waves and the Atlantic high seas forecast for possible developing gale in the south-central Caribbean early in the week. 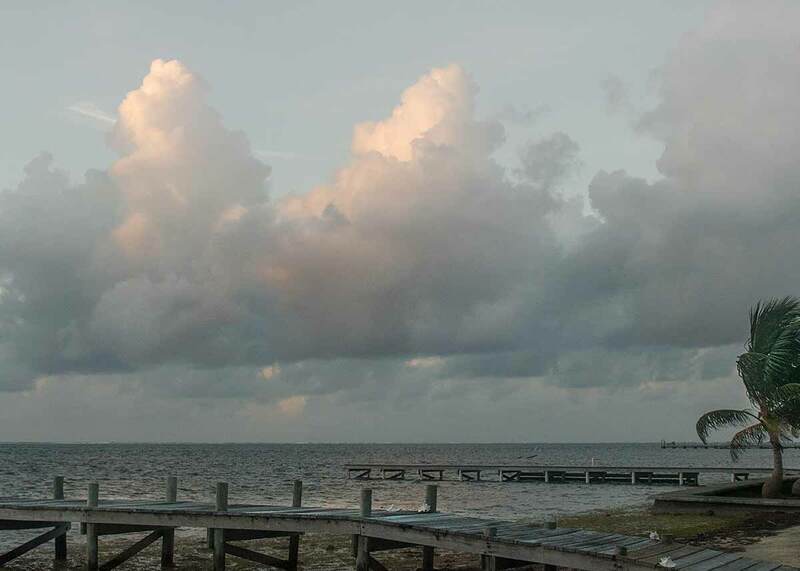 On Ambergris Caye this morning the wind is from the East at 12 mph. We have some sporadic rain showers on the island. It's been dry and dusty so parts of the island will be luckier that others. The sea around our barrier reef is choppy. Today's expected high temperature is 87 f.
The Cloud & rain picture. I have also spotted mid level cloud coming up from Honduras, that is perhaps why there is so much cloud in the Caribbean winds. 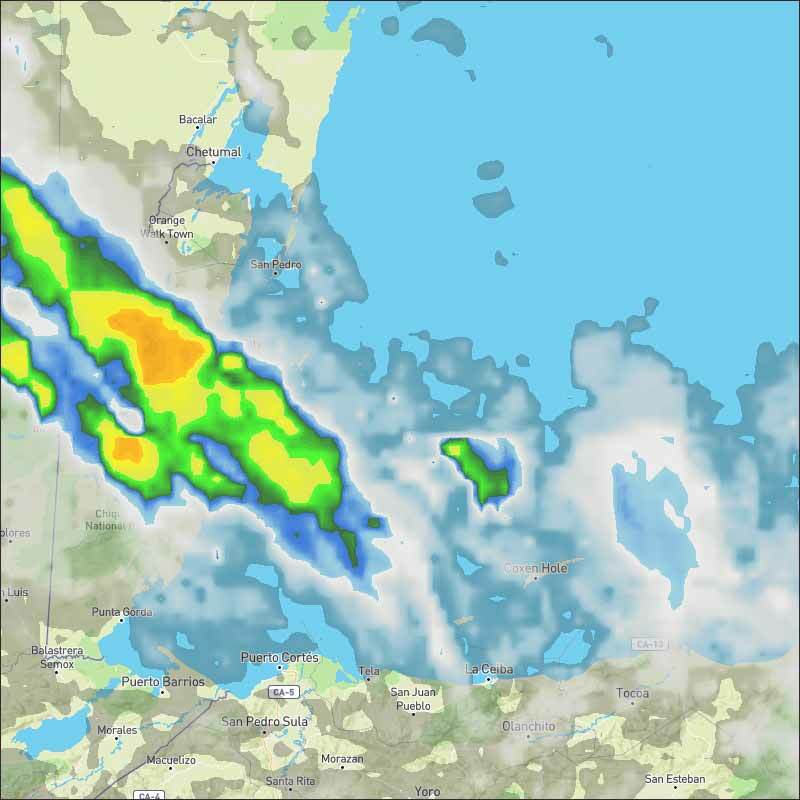 Then the high level NNW cloud clashes causing pockets of rain. And more developing. More significant south mid-level cloud movement now. Lightning now over land.